Common Misconception: All Psychics Are The Same And They All Know Everything. Some of you are wondering why you can’t find yesterday’s episode of Messages From The Other Side on BlogTalkRadio. While there are important lessons to learn from the call, when I re-listened to it, the energy was so negative, I felt I needed to delete it, and after speaking with my husband about it, he agreed. Also, there were no live listeners and it hadn’t been archived yet, so no one else had heard it. Why does this matter to me? People listen to my show to learn, to have fun, to connect with their loved ones and receive validations and signs that their loved ones still exist, and learn how they can recognize the “hellos” they’re receiving directly. That’s what I focus on in my show and I want the energy to be positive, with love, offering a safe place to talk and learn about mediumship and the Other Side. It was very clear the caller wasn’t open to any of this so I didn’t want my listeners to hear her assault on me based upon her own misconceptions, even though I attempted to explain how I work, how we’re all different, what I could and couldn’t do. However, with that said, I would like to discuss some issues brought up during the call. There are valuable lessons to learn here. The caller, unfortunately, held this still very common misconception that all psychics know everything and they all work the same way. Period. There is no room for diversity, there is no room for an individual’s strengths, education, life experiences, or evolution of abilities. There is no room for differentiation between a psychic and medium (one perceives or reads YOU while the other receives information from Spirit). Now, some people can do both but how each psychic/intuitive/medium does this is different. We’re not all the same. We don’t all have the exact same abilities, we don’t all do both. There are plenty of psychics who aren’t mediums. Would you demand they connect with your loved ones on the Other Side when they tell you that’s not what they do, that it’s not something they can do? The misconception that psychics or intuitives know everything is simply that. A tired, old cliche made prominent because of the sensationalism in movies and novels. No, psychics and intuitives do NOT know everything. It saddens me deeply that this still persists. Think about it for a second. Know EVERYTHING?? If we knew everything, we’d all be lottery winners, we wouldn’t have to worry about anything at any time. We wouldn’t go through times of unemployment, of relationship difficulties, of blocked traffic or car accidents, of loss and heartache, of trauma yet…we do! I am constantly telling people I don’t foresee the future yet people still insist that I have to be able to, because after all, I’m psychic, right? I am constantly telling people I don’t/can’t read them, I don’t see auras, I don’t perceive their energy in that particular way and yet, people keep insisting I try. If I decline or refuse, they get angry and yesterday, this caller got really angry telling me I was misrepresenting myself with lies and that my explanations were a “cop-out”. Look, I can’t do what I can’t do and it’s gotten to the point where I now state plainly on-air and in each episode’s description that: “I don’t foresee the future.” yet I still get callers hoping I will, somehow, be able to see their future with a relationship, with their career, with their life despite me saying I can’t. If I can’t, they think their loved ones on the Other Side will tell me and honestly? It doesn’t work that way! Your future is up to you, not them. Every decision you make, every action you take (or don’t take), can and will change the path you’re on and your future will change due to that. My answers and explanations were unacceptable to the caller yesterday. I wasn’t giving her the experience or the information she wanted to hear. She had no interest in learning about how I work (even though she asked), much less learn about the differences between psychics and mediums. No matter how I explained it to her, she wasn’t having it, which is a shame. “How can I word it so you can give me the answer I want?” Almost a direct quote from her with a little paraphrasing. It doesn’t work that way. If I say I can’t do something, I can’t do it. If I play the piano and you shove a guitar in my hands and demand me to play it just because I’m a musician. Guess what? It ‘ain’t gonna’ happen no matter how hard I try! I kept trying to refer the caller to others who might be able to help her, others who give psychic readings but she kept insisting I read her and became very confrontational and mean, demanding that I read her energy. When I told her the only energy I felt from her was confrontational and that blocked any sort of connection with her, she felt that was a cop-out. No, that was the truth. She asked what I was picking up and that’s what I was picking up! I didn’t need any special abilities to sense her energy, it was pretty obvious. Totally blocked and negative and out to prove I was misrepresenting myself. Do your due diligence. If you are seeking an answer about any issue, challenge or problem, make sure you are contacting the right person for the job. The caller interpreted what she read through her own filter of what she wanted, and because I was declining to ‘read’ her, she got very angry. 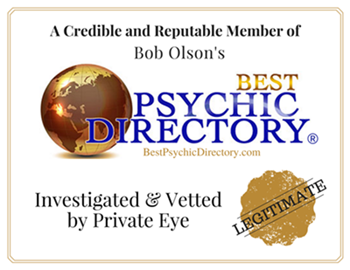 If the caller had done her due diligence and listened to a few of my shows and read my BTR Profile and visited my website, she would have been fully aware of what I can and can’t do, and would have realized she needed to see a different kind of psychic: one who specializes in reading people. Not a medium. People who give psychic readings tap into you and your energy. They perceive you and that can entail seeing and interpreting your aura, sensing your energy and a variety of other ways that I can’t go into because it’s not something I do. Just know, that within that field of expertise, everyone has their own specific abilities and tools to read you. Mediums, however, use different psychic abilities to specifically receive communication from those who have passed on. We actually connect with Spirit. Yes, we need to connect with your energy to make it a stronger, clearer connection to your loved ones but we don’t ‘read’ you. We use the term “reading” for our session because that’s what the industry has generally labeled a session/meeting for a long, long, long time. Important note about the coaching aspect of my work: I’m always very clear whether it’s a message or guidance from my intuition or guides (or the caller’s/client’s loved ones) or if the advice I’m giving is simply from my years of experience in management, personnel recruiting and/or job coaching. I very clearly state this to whomever I’m speaking with, so this caller thinking I misrepresent myself in that light is false as well. So, please, do your due diligence before contacting anyone in any industry to help you solve a problem. Don’t call a doctor if what you really need is a dentist. I have to say: this caller’s assault on my abilities, on my Self, on my integrity is very upsetting. When I decided to go public a year ago, I knew there would be skeptics and I’m okay with skeptics. But when someone goes out of their way to blast you because you tell them you can’t give them what they want and you try to explain only to be told to do it anyway!…then proceed to be called a liar…well, it hurts! I’ve had a good cry (or two), wrote all this out, slept on it, edited this post another few times and decided to publish it. You always hear me recommending to write things out. Most of the time, what you write is simply for yourself: to vent, to release so you can move forward. Since I saw an opportunity to educate within this situation, I chose to share my experience. It’s so hard to explain what I do (and don’t do and why), and how I do it. It’s like asking someone who does complex mathematical equations in their head, “How do you do that?” or the pianist who can pick out a tune on the piano but can’t read music, “How do they know, how do they do that?” They can’t explain it, they just do it the way they are gifted to do those things.